And hold your senators accountable for their vote on the “nuclear” option. Update: Senate Republicans “went nuclear” and voted to end the filibuster on Supreme Court nominees in order to advance Gorsuch’s nomination. His confirmation vote is expected tomorrow. In the meantime, keep calling your senators to hold them accountable for their vote on the “nuclear” option and demand they vote “no” on his nomination. Last night, Senator Jeff Merkley spoke on the Senate floor for more than 15 hours against the nomination of Neil Gorsuch to the Supreme Court. 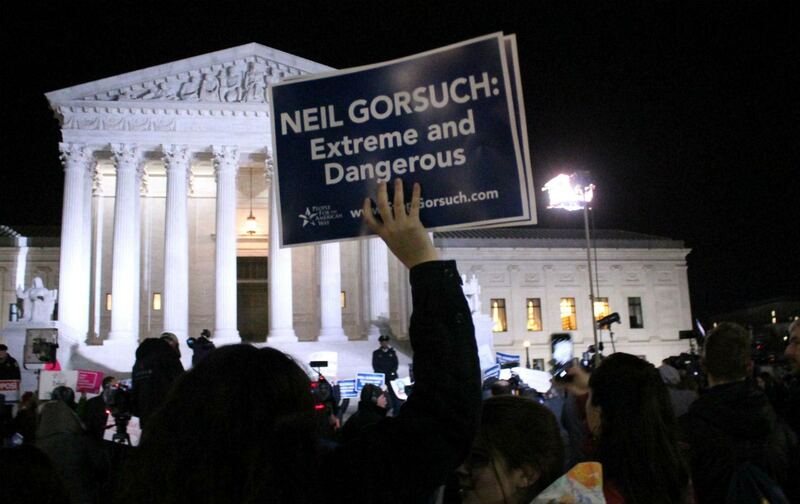 The dramatic traditional “talking filibuster” came after enough Democrats pledged to block Gorsuch’s nomination to prevent Republicans from getting the 60 votes needed to overcome a filibuster. To get past this maneuver, members of the GOP are threatening to change the Senate rules, to use the “nuclear option” to permantly remove the filibuster for Supreme Court nominations. As Nation national-affairs correspondent John Nichols points out, this would be a “further corruption” of the process after Republican refusal to even hold a hearing for Merrick Garland. And, as The Nation’s Ari Berman writes, there are a number of reasons—from the treatment of Merrick Garland to Gorsuch’s own record—to continue to fight this nomination. Keep calling your senators and demand that they reject Gorsuch’s nomination. If you’re represented by a Republican senator, insist that we must change the Supreme Court nominee, not the rules of the Senate. You can reach your senators at the Capitol switchboard at (202) 224-3121 or find senators’ direct numbers here. After you’re done, use the form below to let us know how your call went and what else you might be planning to fight Trump’s Supreme Court pick. You can also use this form to sign up for The Nation’s Take Action list, and we’ll be in touch with more ways you can fight Trump’s extreme agenda.